I’m a fan of sangria, that’s no secret, and for my picnic birthday this year, I wanted to make a whole lot of it for my friends to enjoy as we played bocce ball and croquet. The sangria made me very bad at croquet, by the way. Yes, I’m blaming it on the sangria! 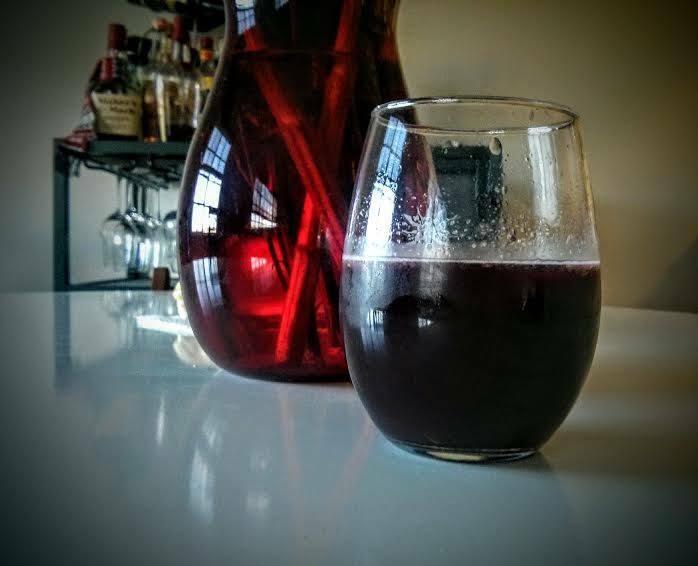 For the novices out there, sangria is a Spanish drink made of red wine, juice and fruit. The red wine part isn’t a hard and fast rule. I’ve had many a delicious white sangria, swapping the orange juice and other traditional citrus fruits for lemonade and peaches. That being said, I like my sangria red. -1 cup OJ (I like no pulp, but pulp is fine because you’ll be adding fresh orange in there anyhow). -1/2 cup Captain Morgan’s Rum (We didn’t have brandy, but you can do it with that, too. I say start with 1/2 cup and pour in a few more shots after you give the lighter version a taste first). Vodka works, too. Why not throw in a little bit of triple sec? Have fun! -1 cup frozen berry mix, defrosted (I bought mine at Trader Joe’s and it was a mix of blueberries, raspberries and strawberries. I feel like pineapple would have tasted good, too.) You can also throw in some red grapes if you prefer something fresh. Pour the wine, OJ and Rum into a pitcher. Then add the sugar and fruit. Let the mixture sit in your fridge for 24 hours to fully marinate. It’s that easy! You can leave the rind on the fruit, but be wary, the longer the wine sits, the more bitter it will become because of the peel. I suggest removing most of the rind to avoid that unpleasant aftertaste on Day 3. Yes, you can keep sangria in the fridge for several days. I made two batches of the recipe above for my party and had about 1/4 of a pitcher left, which my other half and I finished a few days later. The fruit was super saturated with sangria goodness!